Ring Main Unit Market size in 2017 was valued over USD 1.5 billion and is anticipated to exceed an annual installation of 400 ‘000 units by 2024. Rising infrastructural expenditures favoured by ongoing government initiatives toward the refurbishment and expansion of existing grid networks will boost the global ring main unit market size. Residential and commercial developments along with rapid urbanization across emerging regions positively drive the business dynamics. Increasing demand for replacement and upgradation of conventional primary & secondary distribution networks across Europe and North America will further complement the industry outlook. Exponential increase in consumption of energy along with rising concerns for energy security will fuel the overall ring main unit market share. Growing infrastructure complexities owing to steep rise in demand for electrification further obligate the integration of network control & protection equipment. In addition, affirmative microgrid network expansion strategies favoured by flourishing renewable energy industry will positively influence the overall industry dynamics. 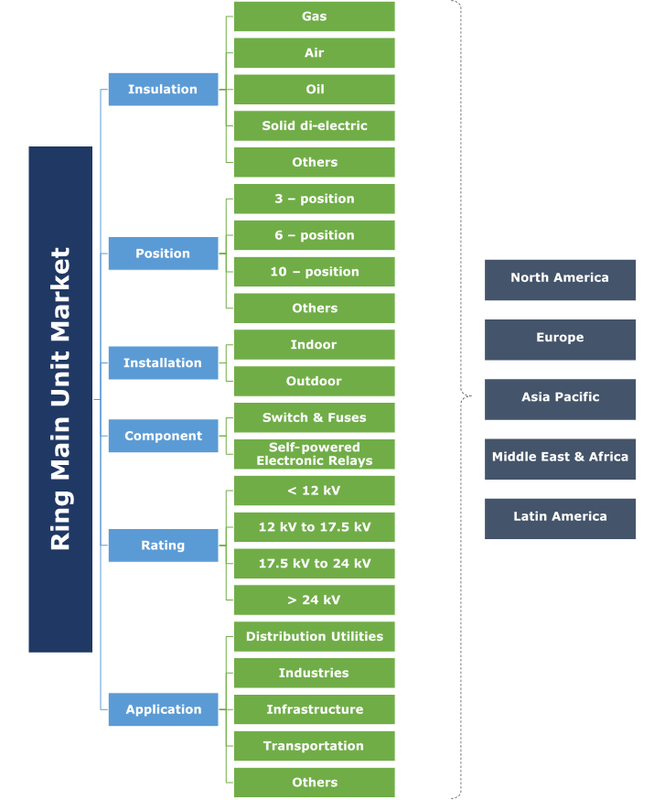 Operational safety, effective di-electric strength, and system compactness are key parameters which will propel the gas insulated ring main unit (RMU) market size. Advancing smart control technologies adhered by limited competition from its traditional industry counterparts including oil and air will further stimulate the product demand. Oil insulated ring main unit market owing to volatility in crude prices holds a marginal share across the industry landscape. The technology is anticipated to witness moderate growth pertaining to the need for additional equipment for the service and maintenance of systems which in turn increase the operational costs. Moreover, positive utility inclination towards the deployment of gas insulated units pertaining to safe and reliable operations have further restrained the industry growth. Rapid commercialization and increasing residential establishments across emerging nations will stimulate the 3–position ring main unit market share. Expansion of grid connected and isolated micro-grid infrastructure to ensure security of supply will escalate the product penetration. In addition, ongoing electrification measures infuse substantial potential for 3-position units subject to lower peak load demand across the rural establishments. 6-position ring main unit (RMU) market share will grow in line with increasing industrial focus towards the development of captive power generation plants and manufacturing units. Growing demand for high tension electrical infrastructure across suburban establishments along with rising measures toward operational reliability and grid safety will further foster the product demand. Indoor ring main unit market share in 2017 held the majority share on account of ongoing upgradation and development of existing electric substation infrastructure. Flourishing real estate sector subject to growing private and public investments will escalate the business growth. In addition, increasing space constraint across utility aided electric installations along with focus towards operational safety & grid reliability will further complement the business scenario. Easier fault detection and lesser time required for installation are some of the essential parameters which will fuel the outdoor ring main unit market. Competitive capital cost positively influenced by minimal probability for fault across outdoor deployment further strengthen the product demand. Switch & Fuse on account of reliable operations and lower costs across high tension applications has observed substantial penetration across the overall ring main unit market. The technology subject to ease of replacement hold extensive applicability across commercial and residential applications. Since the products are prone to continuous replacement on circuit failures which may hamper the product demand, however lower costs of replacement might compensate for the limitation. Self-powered electronic relay owing to improved fault response techniques along with precise monitoring are estimated to observe steep increase across the global ring main unit market. Higher costs of these units may impede the product penetration, whereas efficient product configurations along with ongoing technological developments will foster the overall business outlook. The ≤ 17.5 kV RMU market is anticipated to witness a considerable growth owing to its wide applications across process industries, power, and infrastructure sectors. The rapid adoption of sustainable sources across the residential deployment along with the expeditious development of micro-grid networks will augment the business potential. The rising demand for compact transformers along with the price-sensitive consumer behaviour has obligated the manufacturers to adopt a sustainable production mechanism. In the recent years, the 17.5 kV to 24 kV RMU market due to the expanding commercial sector across the region have witnessed a sheer turnaround. The growing demand for manufactured goods along with flexible product operations across the secondary and primary distribution networks will complement the industry growth. Energy efficiency compliance and operational safety are anticipated to significantly influence the business landscape. The ongoing research pertaining to the development of sustainable units along with stringent manufacturing norms across the region will complement the distribution transformer demand. Distribution utilities in the current competitive scenario hold a majority market share on account of ongoing utility-based establishments to cater the increasing urban and rural electricity demand. Favourable government initiatives pertaining to the deregulation and channelling of supply and demand side networks will further enhance the RMU market dynamics. Industrial applications across the ring main unit market is set to witness moderate growth owing to the expansion of manufacturing units by large market players including ABB, Siemens and Schneider Electric across developing regions. Volume manufacturing practices coupled with increasing demand for cost effective product development will further foster the business outlook. 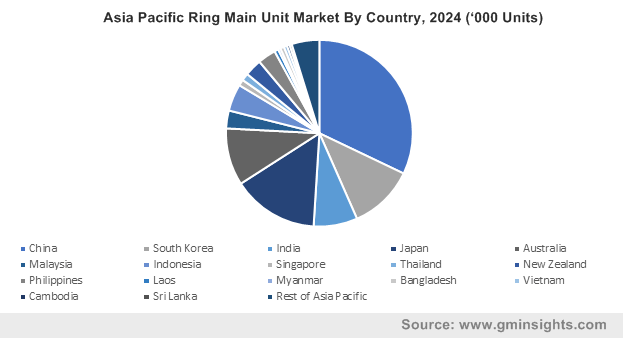 Asia Pacific ring main unit market is anticipated to grow at 7.3% by 2024. Advancing economic scenario owing to rapid commercialization and investments across the industrial and utility-based electrification systems will drive the industry landscape. In 2017, the Rural Electrification Corporation of India (REC) generated USD 450 million through the launch of its bonds on London Stock Exchange. In addition, growing microgrid network coupled with increasing investments towards renewable energy integration has further instituted a favourable business scenario. Increasing electricity demand coupled with technological advancement will stimulate the ring main unit market in Europe. Increasing investments towards renewable energy sector will foster the business landscape in Germany. The European Union’s Renewable Energy Directive enacted a legislation for production and advancement of energy from renewable energy technologies. Increasing infrastructure spending in transportation and commercial sector will foster the industry growth in UK. Prominent ring main unit market players comprise of General Electric, ABB, Eaton, Schneider, Siemens, Crompton Greaves, L&T Electrical and Automation, Lucy Electric, LSIS Co., TIEPCO, C&S Electric Limited, Entec Electric and Ormazabal. RMU makes, breaks & carries the load current and minimizes electrical fault along with metering & regulating of various parameters across the electrical power system. These products are installed by utilities, industrial & residential consumers across primary & secondary distribution networks.